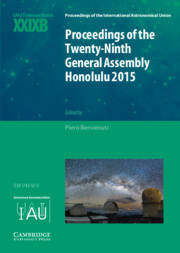 These Transactions provide a record of the organisational and administrative activities of the IAU XXIX General Assembly which took place in Honolulu, Hawai'i, USA, in August 2015. They report and record all of the essential decisions taken by the governing body of the IAU. These include the approval of the financial accounts and of the proposed budget for the next 3 years, the admission of new national and individual members, the evaluation of Division and Commission reports, and the approval of Resolutions. This General Assembly also completed the internal restructuring that began in 2012, with the approval of 35 new Commissions, together with their elected Presidents and Organising Committees. A further change to the scientific programme of the XXIX General Assembly was the substitution of the Joint Discussions meetings and Special Sessions with a single entity, designated as Focus Meetings and published in the new ?Astronomy in Focus? series. Preface; 1. Opening remarks; 2. Business; 3. Closing remarks; 4. Resolutions; 5. Executive Committee Report; 6. Appendix; 7. COMM Reports; 8. Statutes; 9. New and deceased members; 10. Div Comm ; 11. Members Divisions; 12. Members Commissions.